Cartesio Journals are handmade in Florence Italy. 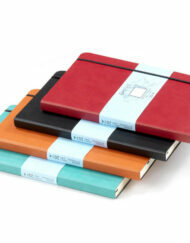 Essential, casual and indispensable each 94 page faintly ruled journal is made of recycled italian leather. The light ecru pages are fountain paper friendly. With its soft cover and black vertical elastic, the Cartesio Journal will win you over with its simple contours, not to mention the selection of colors.